La Nouvelle Orléans -- "le petit Paris d'Amérique"
La Nouvelle-Orléans was founded May 7, 1718, by the French Mississippi Company, under the direction of Jean Baptiste le Moyne de Bienville, on land inhabited by the Chitimacha. It was named for Philippe d'Orléans, Duke of Orléans, who was Regent of France at the time and whose title came from the French city of Orléans. The French colony was ceded to the Spanish Empire in the Treaty of Paris (1763). 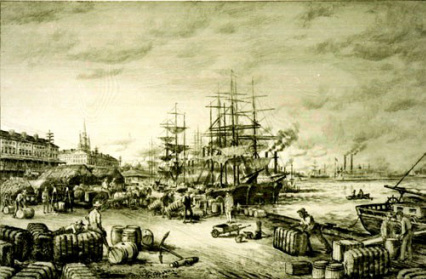 During the American Revolutionary War, New Orleans was an important port to smuggle aid to the rebels, transporting military equipment and supplies up the Mississippi River. Bernardo de Gálvez y Madrid, Count of Gálvez, successfully launched the southern campaign against the British from the city in 1779. New Orleans remained under Spanish control until 1801, when it reverted to French control. Nearly all of the surviving 18th century architecture of the Vieux Carré dates from this Spanish period. (excepting the Old Ursuline Convent.) Napoleon sold the territory to the United States in the Louisiana Purchase in 1803. Constantly changing hands, New Orleans has been a true melting pot of cultures over her history. Beginning with French speaking Europeans, the settlement saw the influence of West African slaves, Spanish speaking colonials, mixed-race Creoles, French speaking Acadians, and even the Irish. 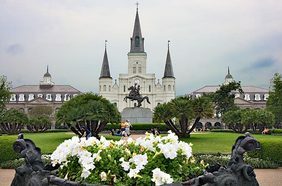 New Orleans has blended the cultures, languages, musics, and foods of all of those rich influences and become arguably one of the most unique cities in America. One notable eccentricity of the city is its long and often glamorized relationship with that most mysterious of religions: Voodoo. 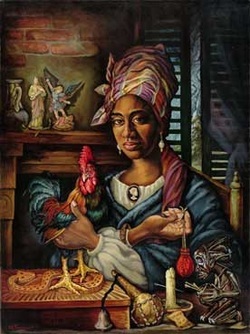 The home of famed Voodoo priestess Marie Laveau, New Orleans has long been associated with the more hedonistic and visceral side of life, and the way the city worships is no exception. Though mostly Roman Catholic, you will still find many New Orleanians entertaining beliefs of a more superstitious nature. New Orleans continues to thrive, never slowed by her nearly three centuries in existence. The New Orleans Metro Area has a population of over one million, a number the city struggled to regain after the devastation of Hurricane Katrina. But no matter what tragedies the city has faced, whether plague or war or natural disaster, the spirit of the city cannot be kept low for long. Laissez les bons temps roulez! !